History of American Injustice - Mani­fest Destiny of Impe­rial Decline. 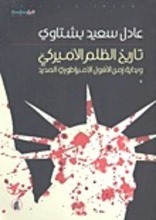 Once again Adel S. Bishtawi, author of History of Injustice in the Arab World, puts his capti­va­ting literary style and scho­larly ratio­nale in the service of his new book: History of American Injustice - Mani­fest Destiny of Impe­rial Decline. The new book is an analytical exer­cise in decon­struc­ting and recon­struc­ting the percep­tions curr­ently being marketed about the United States of America. It is a deli­cate dissec­tion of its history, world­wide in general and in the Arab region in parti­cular. The import­ance of this book stems from the ability of its author to sepa­rate and examine indi­vi­dually the nume­rous elements of the American aim to control its global sphere of inte­rest. The US pursues this goal guided by a three-headed monster: mili­tary power, a US dollar floa­ting on a sea of Arab oil and a collec­tion of lesser important tools that include American multi­na­tional corpo­ra­tions, Holly­wood, certain sections of the media and the inter­na­tional orga­ni­sa­tions estab­lished at the end of World War II to serve and promote American inte­rests globally, such as the World Bank and the Inter­na­tional Mone­tary Fund (IMF), better known collec­ti­vely as the Two Ugly Sisters. This book should assist the atten­tive reader in re-evalua­ting the most important political issues in the Middle East as the author examines events past and present from a refres­hingly new perspec­tive. An example of this approach is the author's unor­thodox analysis of the US exploi­ta­tion of the 1973 Arab-Israeli war and the subse­quent Arab oil embargo, by extrac­ting OPEC's pledge to price oil in US dollars. Another is his expla­na­tion of the reasons behind the post­po­ne­ment of the American-Israeli strike against Iran in 2005 due to former Israeli Prime Minister Ariel Sharon's massive stroke, which cast a dark shadow over the ability of any succes­sive Israeli leader to under­take such a dange­rous task. Uncom­pro­mi­sing as always, Bishtawi, a distin­gu­ished writer of fiction of non-fiction, finds it hard to set aside his literary tech­ni­ques. As a result, an ordi­nary issue that would other­wise be accorded minimal detail is dissected and examined, revea­ling a multitude of signi­fi­cant aspects. One example is his refe­rence to Specia­list Lori Pies­tewa, a Hopi, who was the first indi­ge­nous American to die in Iraq. Her death became the conclu­sion to a chapter entitled The Red Holo­caust, which traces the history of the deci­mated noble nations, and the economic and social pres­sures that lead a surpri­singly higher propor­tion of indi­ge­nous Ameri­cans to enlist in the army. Other unique quali­ties include the author's compre­hen­sive rese­ar­ching and cross-refe­ren­cing of topics using, as many quali­fied sources as possible. Many of the issues analysed in this book belong to a litany of war-related events and situa­tions that have mostly been avoided by main­st­ream (corpo­rate) jour­na­lism. This explains the substan­tial use of Internet links as refe­rences. For some readers, the rela­ti­vely heavy use of such refe­ren­cing may be a distrac­tion, but it should be of great value to Arab students of the economic and political history of the Arab world and the world at large, in view of exten­sive American inter­ven­tion in the region. The book utilises the cons­i­de­rable expe­ri­ence of the writer in the areas of jour­na­lism, rese­arch, history, fiction and human studies. He was Central Mana­ging Editor of the Emirates News Agency, and a co-founder of two of the most promi­nent news­pa­pers in the Arab world, Al Sharq Al Awsat and Al Hayat. It is diffi­cult for those delving into Bishtawi's various works to ascer­tain which of his writing tech­ni­ques mix with others. Suffice it to say, the ulti­mate effect on readers is enhanced satis­fac­tion in their reading, and the encou­ra­ge­ment of literary critics to study these tech­ni­ques further. One example of how Bishtawi exploits his past expe­ri­ence in adding extra depth to his work is when he narrates how surprised he was to note, during a trip to Canada where he met a number of offi­cials and parlia­men­ta­rians, that while they supported the rights of the Pales­ti­nians, they were keen to avoid mentio­ning the inse­pa­rable right to self-deter­mi­na­tion. As it turned out, to say so in public would appar­ently be mistaken by righ­tists as an oppor­tunity for the poten­tial self-deter­mi­na­tion of the indi­ge­nous Indian popu­la­tion, which could encou­rage them to demand more rights than the country was comfor­table to offer. Bishtawi is in no doubt that the July 2006 war between Israel and Hizbollah was one of the two most important wars in the Middle East thus far (the other being the Iraq war). His intro­duc­tion to a chapter about the July 2006 war, entitled David's Stone, is a further example of the combi­ning his personal expe­ri­ences with histo­rical know­ledge, as well as a strong back­ground in jour­na­lism and rese­arch. He narrates how, while visi­ting rela­tives in his native Pales­ti­nian town of Naza­reth, he was presented with two gifts one of them a sling stone found by acci­dent in the Jezreel valley (Arabic: Marj Bin Amer), where ancient wars were fought. Drawing biblical paral­lels, Bishtawi pres­ents Hizbollah as little David, hurling the stone that was to put an end to the might of Goliath. What follows is an analysis of how the concept of victory and defeat was changed forever after Goliath was struck by David's stone. Wars thereafter were never the same. Katyusha rockets and other crude home-made explo­sives, today's equi­va­lent of David's stone, have become the ulti­mate deter­rent. Hamas, he notes later on, subse­qu­ently realised the import­ance of deter­rence in any conf­lict, and under­stood that attemp­ting to balance the scales of power, no matter how unequal the resul­ting balance is, will dramati­cally change the result of conf­licts in ways similar to the one fought in summer 2006 close to Lebanon's southern border with Israel. Readers fami­liar with Bishtawi's other works, inclu­ding his novels, will notice the super­im­po­si­tion of his fictional style on this politico-histo­rical book. The segmen­ta­tion of chap­ters allows for effort­less reading and the easy tran­si­tion from one chapter to another. Bishtawi prepares surprises for his readers in certain places, tech­ni­ques usually reserved for novel-writing. The titles of chap­ters and sections are witty, but their content is suffi­ci­ently and neces­sa­rily serious. One such example is the title: Meso­potamia- The Land Between Two Oil Reser­voirs, to denote the vast­ness of oil reserves in Iraq. Another is: The Kham (Arabic for crude oil) of Uncle Sam, to imply the control of the US over Arab oil. Like­wise is the title: The Dollar of Uncle Kham (Kham is used here to denote Arab oil expor­ters), to explain the vital role played by Arab oil produ­cers in prop­ping up the US dollar by accep­ting a dollar pricing system. The author almost summa­rises the entire content of a large chapter in his book by naming it The Red Holo­caust. This, clearly, is what befell the indi­ge­nous American Indians. Mani­fest Destiny of Impe­rial Decline - A History of American Injustice is another important book that should be added to Bishtawi's exis­ting politico-histo­rical biblio­graphy, begin­ning with his autho­ri­ta­tive study of the Anda­lu­sian Moriscos through to his most recent work History of Injustice in the Arab World. (Hussam Uddin Mohammed). Tarikh al-thilm fi asr al-inthama al-watania.